Dreaming of studying abroad but worried about the cost? 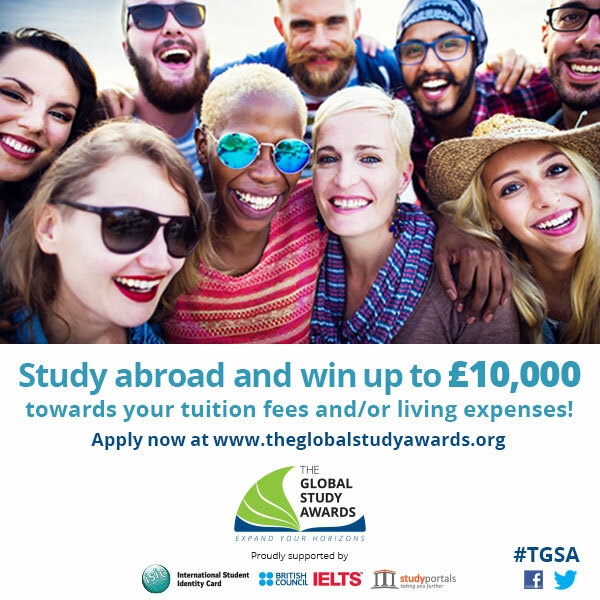 Apply for ‘The Global Study Awards’ for a chance to win up to £10,000 towards your tuition fees &/or living expenses! To ultimately encourage young people to study abroad as part of their tertiary studies in order to experience and explore new countries, cultures and languages, the ISIC Association, StudyPortals andBritish Council IELTS are launching The Global Study Awards (TGSA). The Global Study Awardsecognises the value of studying abroad as a positive life changing experience for many students, opening their minds to alternative ways of succeeding in their personal life and professional career, as well as promoting intercultural understanding and tolerance. be able to provide a confirmation letter and/or official enrolment letter (if applicable) from the institution by the cut-off date. Apply now by completing the Application form! Please note that your application must be submitted in English only.